Blog Quick Quotes: Club Q Inspiration with Neva! Club Q Inspiration with Neva! Neva here today to share a layout created from the June's Club Q Altered Kit. I really liked the combinations of papers in this kit and thought it was perfect for the photos of my son's birthday. The greens from the Secret Garden sheet matched the wrapping paper in the photos. The reverse side of the Secret Garden sheet with it's multi-colored jellybeans was a great compliment to the brightly hued photos. Club Q Kits contain lots of amazing pre-cut shapes and other papers come as whole sheets. In this project I used the Altered Kit from June as is with one sheet addition. The piece of Sonata 103 wasn't as large as I wanted for the layout so I used another sheet from my stash. All the other pieces are used in dimensions included in the kit. Sonata 103 is trimmed to 6" x 12"
The right side section is trimmed to 6" x 7". All edges of papers are inked with Powder Puff Chalk Ink in Capri Blue. The layout is adhered together with each of the inked edges on all of the pieces showing. The enamel dots are added in a triangle to balance the design. The remaining section of Sonata 103 and the piece from the kit are used to create the stamped embellishments. 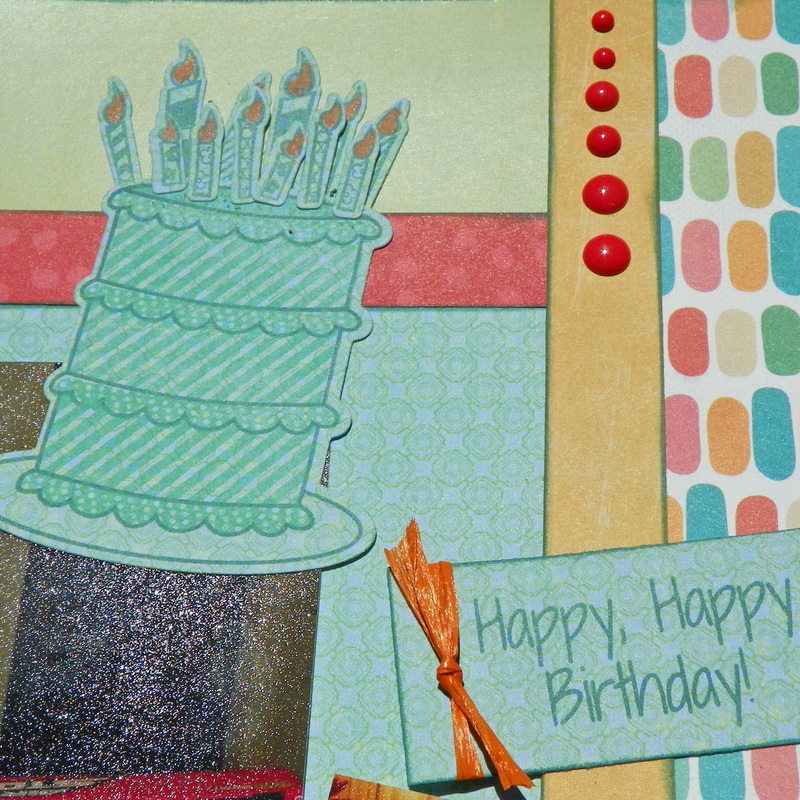 The Happy Birthday sentiment is die cut from Spring Showers 104 left over from another layout. If you have every wondered how to stamp a layered stamp that has a matching die cut, here is the method I have found to get it right the first time! Die cut the image from cardstock first, then place the whole section into a stamp positioner. You may use re-postionable painter's tape on the reverse to hold the die cut in place, (not shown). 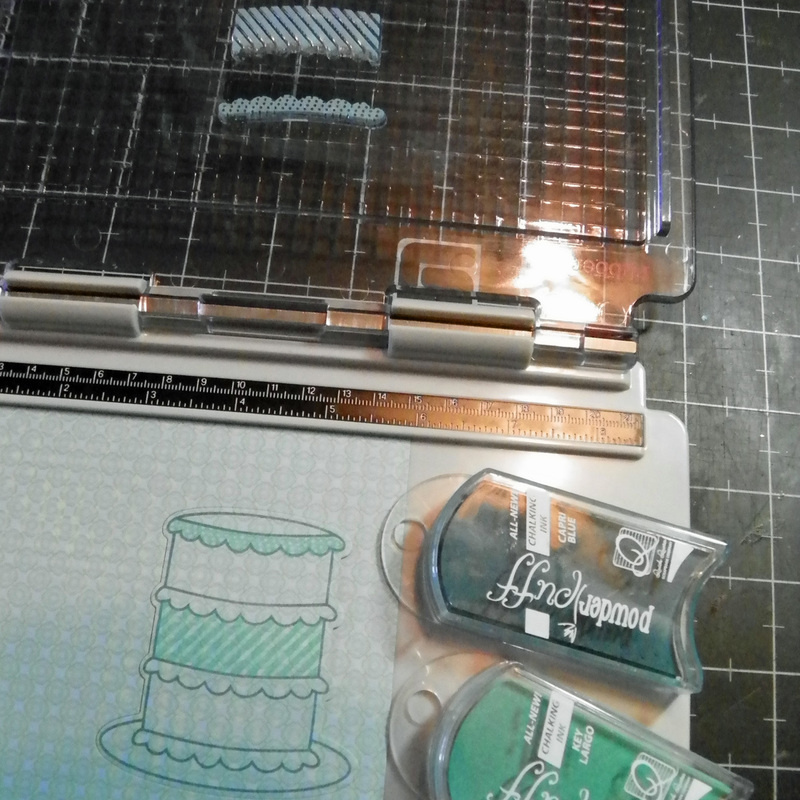 Stamp the outline first, I used Capri Blue for the cake. 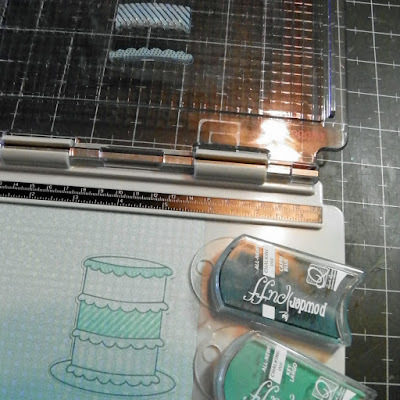 Look from directly above the image down through the acrylic stamp to line it up with the die cut. Allow the stamp positioner to pick up the stamp then stamp the image. Repeat for each of the layers. The frosting on the cake is stamped in Key Largo. 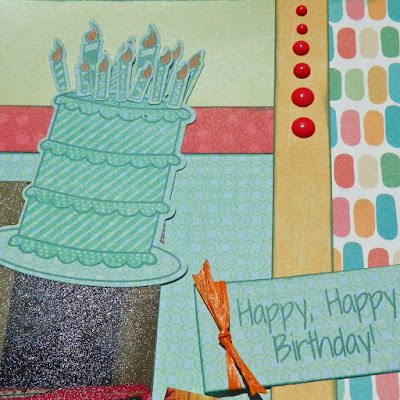 I stamped different sections and was able to complete the cake in three phases. This is the finished version complete with proper number of candles. Also shown are the enamel dots and one of the stamped sentiments. The candles are stamped with the method above and then the flame is colored with Island Orange and a Fantastix brush tip. 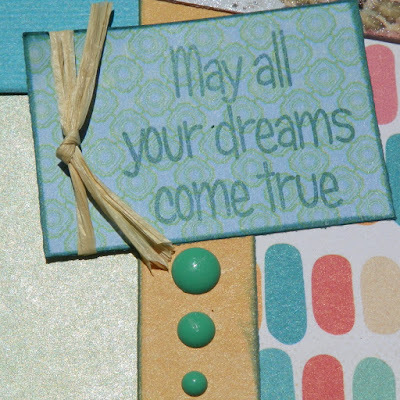 The sentiments are stamped in Capri Blue and the edges are inked with the same color. Each of the stamped sentiments have a small piece of twine from the kit tied around one end. A smaller tag is hand cut from Sonata 103 to match the shape of the tag from the kit. 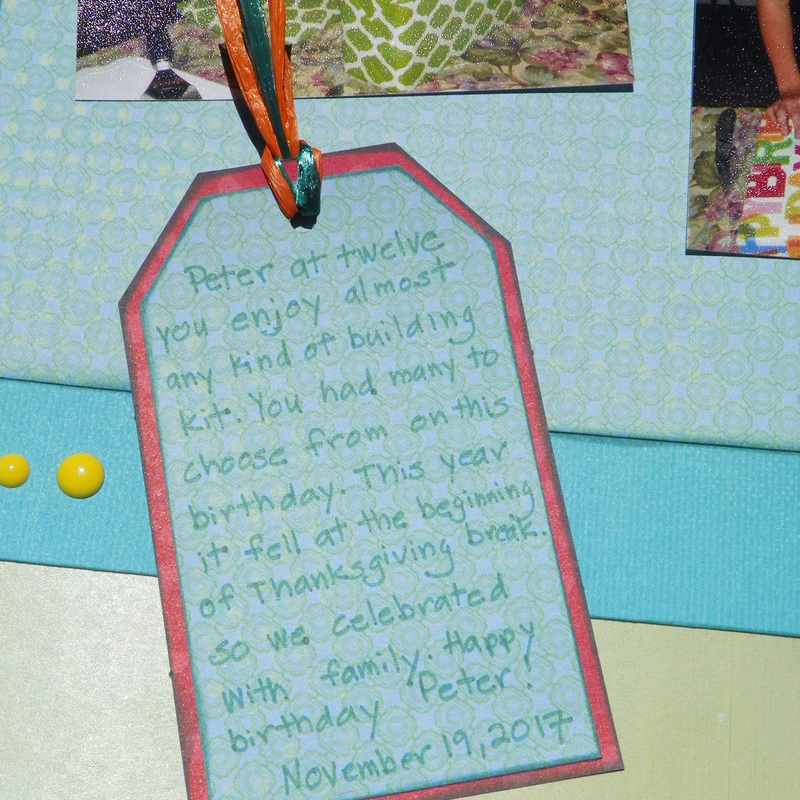 Two pieces of twine decorate the top of the tag. 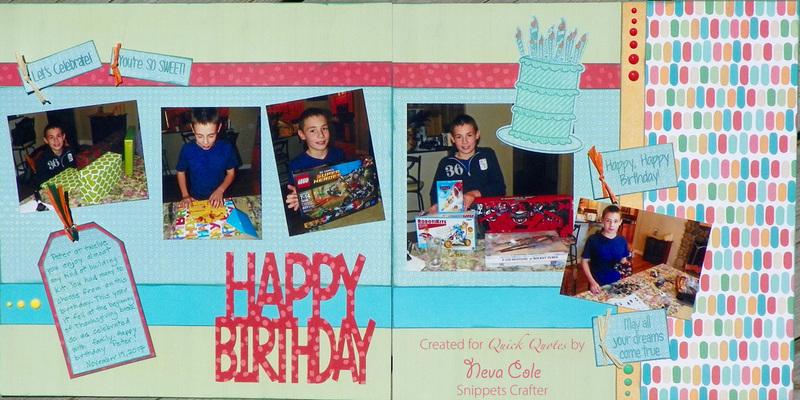 It was so fun to use the Altered Kit for a layout that was perfect for my son's birthday. Thanks for joining us at Quick Quotes today!